IN THE US, two 12-year-old girls have been accused of stabbing their friend 19 times in what they claim was a tribute to the fictional character Slender Man. The two girls stated they wished to become ‘proxies’ of Slender Man, who they hoped to join in his ‘mansion’ (read the full report on Sky News). But just what are they talking about? Slender Man is an urban legend that began online back in 2009 as a simple Photoshopped photo on the SomethingAwful forums. The creature is depicted as an unnaturally tall, thin man with a blank and featureless face, wearing a black suit. In some cases, he can have tentacles that protrude from his back. He is said to stalk, abduct and traumatise people – mostly children. 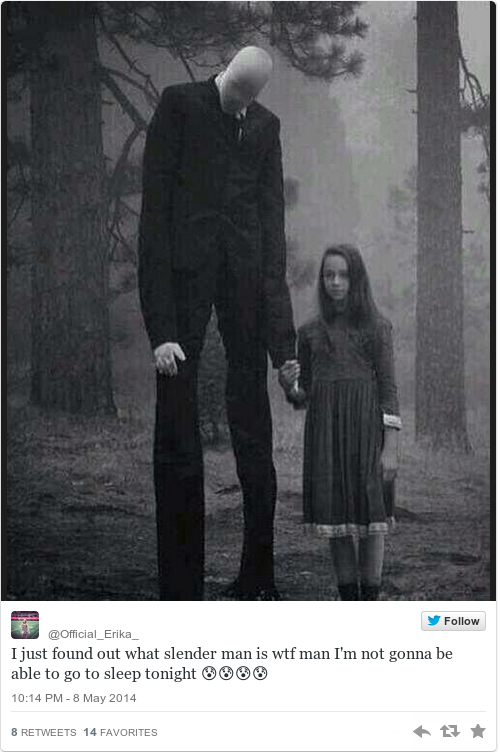 According to Know Your Meme, Slender Man’s creator, Victor Surge (AKA Eric Knudsen), presented the Photoshopped images as actual photos of children who were allegedly abducted by the monster. Slender Man lurks in the background of each photo. After the initial photos, Slender Man ‘fans’ began incorporating ‘Slendy’ into horror stories, art and video projects. Additions to the storyline include ‘The Sickness’ - paranoia, nose bleeds and coughing fits which occur when people have an encounter or are being stalked by the Slender Man – and ‘The Obsession’, in which people attempt to become ‘proxies’ (people who are under the influence or control of) of the Slender Man. Marble Hornets, a creepy Blair Witch-style YouTube series that continues to this day, centres on a film student who constantly sees the creature in his film footage. A horror video game based on the character, Slender: The Eight Pages, was created in 2012 – players often record their terrified reactions to the game. Sites like Creepypasta.com, which the girls reportedly visited often, contain pages and pages of theories on the Slender Man myth. Email “Everything you need to know about horror meme Slender Man”. Feedback on “Everything you need to know about horror meme Slender Man”.